Why don’t the British eat horse meat? On holiday in France the other week, we spent a morning wandering round the weekly market in Chablis. There was a little butcher’s van there, a chevaline boucher, a horse meat specialist. I bought a small piece of faux fillet for a couple of Euros, took it home, seasoned it and cooked it. The meat was sweet, very tender and tasty. It had a slightly game like edge to it. Different to beef, but not that dissimilar. Very palatable, actually. If I lived in France, I’d eat more. Now, I realise at this point, there may be people – there will be people – who feel completely revolted by the very idea of eating a horse. It simply isn’t the done thing in Britain and most of the English-speaking world. It’s so far beyond ‘not the done thing’ that it’s verging on taboo. Standing back from this and looking at it logically and dispassionately, the horror generated at the thought of eating horse doesn’t make sense when stacked against the British love of beef, pork, and – in particular – lamb. It’s so different that we don’t even have a proper derivative word for it in the way that cow meat is beef or sheep meat is lamb or mutton. Where it has been sold or marketed in English-speaking countries in the past, it’s been done so under the name ‘cheval meat’, from the French. There’s some history and culture to this, as well as a dash of religion. Pope Gregory III forbade the eating of horse meat in the eighth century, in response to the ritual slaughter and feasting practiced by Germanic and Celtic tribes in Northern Europe. Iceland refused to convert to Christianity until the Catholic church bent the rules slightly and gave them a pass-out on the ‘no horse’ rule. Despite this, horse meat seems to have just fell out of favour. Legend has it that the French tradition of horse consumption dates from the Battle of Elyoa in 1807, when officers encouraged starving troops to eat their dead battle horses to ease their hunger. Horse meat was roasted on cavalry breastplates in the middle of a devastated battlefield. There’s also evidence that Napoleon’s surgeon general, a man called Baron Dominic-Jean Larrey encouraged the eating of horse meat among troops as a way of avoiding scurvy. The troops got a taste for it, and the practice continued. Horse became part of, and persists in the French national cuisine, in a way that it hasn’t on this side of the Channel. It isn’t true to say that the British have never eaten it., though. It was never particularly popular, but horse meat was widespread into the thirties and later. It wasn’t rationed during the war, which helped to keep demand for it steady. Yorkshire was the last outpost of horse meat-eating, with a butcher in Doncaster trading until 1955. The journalist Matthew Fort writes about this on his blog…note the reference to ‘cheval’ in the butcher’s window. Fort suggests in a separate piece that horse consumption fell out of favour in Britain because of the rise of the engine, which effectively replaced the horse and reduced the commonness of horses, and the parallel rise of riding as a leisure pursuit. This led to the development of a sentimental angle to things…horses started to be seen as pets, and the ingrained British sentimentality towards pets of any description started to take over, and eating horses slipped quietly from unfashionable to taboo. It’s a cultural issue for the British, and there’s nothing wrong with that – cultural and societal things like this don’t need to make sense. They just are, and that’s enough. That’s not to say that these things can’t be challenged, and this is certainly one of those things that should be. 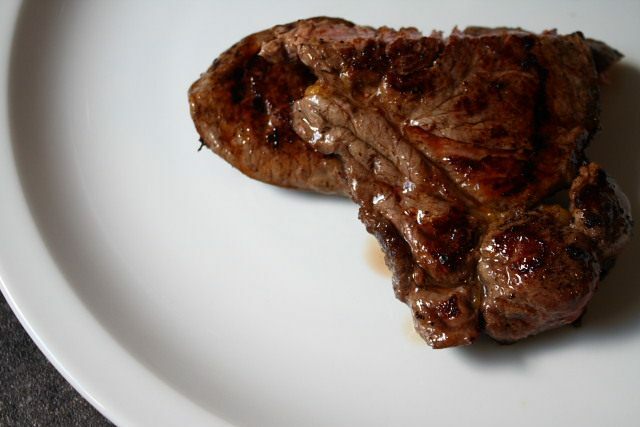 Horse meat is very, very good, and it deserves a greater audience in the UK. Have you ever tried horse meat? Would you? I’ve eaten horse, though not for almost 30 yrs – when I lived in France as a student in the early 80’s. Have to say it was good – my memory of it being very in line with your description. Would I eat it again? yes, probably, subject to my usual concerns around animal welfare, in raising & slaughter. I don’t (or try not to) buy/eat battery/intensively raised meat. Happy chickens/pigs. Lamb is good as always free-range, game too! Don’t know what the picture is for horse. Very well written post. Horse meat is some what controversial, maybe because people mainly see it as a pet then as food. 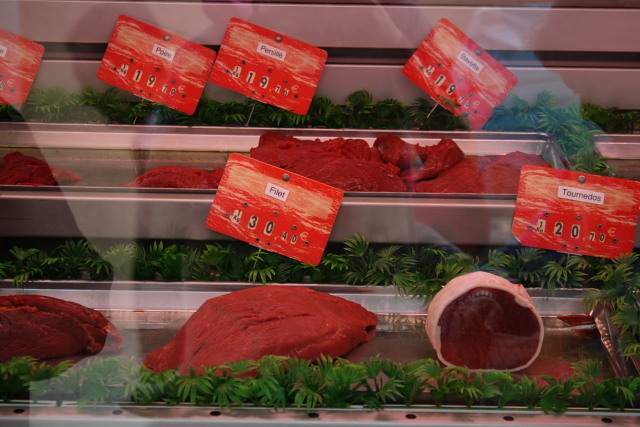 However here in Holland some butchers do sell horse meat, normally steak. I’ve eaten it before and the meat sure is tasty. It is a bit sweeter then beef and it has a slightly different taste it. you know it is there, but can’t put your finger on it. Therefore I believe that if you don’t know it was horse meat you’ll think it is beef. Really interesting piece, I knew that horse meat used to be eaten in this country but had no idea that Doncaster was the last bastion of British horse butchers! Yes, it was about medium rare. It was very tender. Oh, and I’ve seen horse sausages on sale in Germany, and I believe the Italians eat it too. It may be that we’re the odd ones out on this, in Europe at least. It’s common in Italy, especially in the North, I’ve heard, and also in other parts of Europe. The Japanese sometimes eat it as a sashimi! Growing up in Germany, I remember my mother cooking horse meat occasionally, as it was cheaper than beef. However, she never told my dad what he was eating. When I first came to the US, there was a meat market at the Pike Place Market in Seattle that sold horse meat. I bought a steak there once and fixed it, but somehow I did not enjoy eating it. Well, we have plenty of horses in Boulder County, Colo, and we definitely have an affinity for local foods. But somehow, I can’t picture equestrian stew sitting well with Boulderites. This is such an interesting post. Thanks for sharing! This is one of those things I wouldn’t try. When I lived in Sicily, they sold it in larger markets…but…no, I couldn’t. However – I have to say it was a very thought provoking post. Great post! I’ve never tried horse nor do I think I have the courage to try it. I was traveling in Chile and saw horse jerky for sale but I’ve never seen horse meat for sale in a market. Thanks for sharing! I’ve had it as sliced sandwich meat as a teen in The Netherlands. Got my mum to buy some out of curiosity, not bad as I recall. Certainly not the worst thing I ate while living abroad! It’s an interesting subject – one that I wrote about as part of my degree dissertation. I believe, as Matthew Fort mentioned in his post, that it is partly to do with the horse moving from being a work animal to a leisure/pet animal with the onset of mechanisation – so most British people would no sooner eat horse than they would eat dog or cat meat. Interestingly, during a European study tour on my Equine Science degree, the tutor with us did buy and eat horse meat, much to the outrage of most of the students! It is not the eating of horse that would upset me, but the practice (as with much intensively reared meat) of transporting it across Europe in horrific conditions prior to slaughter, that would put me off. I spent my early years in the Netherlands where horse was commonly eaten, my parents are South African so this was never a big deal to them to buy and cook and eat it. In fact it was very strange when we moved to Britain and suddenly it was a HUGE taboo. In fact, my sister and I learnt pretty fast not to tell anyone that we ate horse when we lived abroad because we were actually losing friends! In Germany, horse meat is traditionally used for Sauerbraten (which can be made with beef, too … it’s a roast that gets marinated in a wine/vinegar/spices mix for up to a week before roasting it, as a way to tenderize not-so-great cuts of meat). Despite the fact of being a horseback rider myself, I quite like it, as it has great texture and the taste somewhere between beef and game lends itself well to the very present sour note of this dish. To” Kokori….you are really quite the sport but I would surely not want to be your horse. Really interesting post, thanks! I understand that bresaola was originally made primarily with horsemeat although it’s largely beef these days. I did have a horse when I was younger and so I guess I’m slightly averse to eating something that is a pet, but I definitely would have it if it was put in front of me. In Tokyo, I was lucky enough to have a Japanese guy take a group of us from the hostel to a BBQ restaurant. He wouldn’t tell us what any of the meat was until we’d tried it. Turned out I ate some tripe among other things I’d never have eaten in a million years had i known what they were. Meat is meat! I’ve eaten squirrel, dog and crickets though, so you may want to disregard anything I say. In Japan we used to eat a lovely nigirizushi with tataki of horse meat. Twas lovely. My girlfriend this morning asked me where she could find horse meat in UK as she couldn’t find it anywhere. (she’s Italian). I had to explain that here in UK, horses are looked at more as pets like dogs and cats. As for whether I’d try it.. I think so, once I get my head away from thinking about Black Beauty. Ian…may I suggest you keep Black Beauty firmly in your mind? I mean, really, must we humans eat everything we see? It’s a bit disgusting if you allow yourself to think about it. I am hoping you can read Black Beauty to your Italian girlfriend – might help things. On my very first trip to France to meet my future in-laws, I was introduced to Horse steaks (cheval) and was an instant convert. Not only was it very tasty-in fact as a devout carnivore I found it tasted better than the finest piece of beef eye fillet-it is very good for you as it is leaner and it’s overall saturated fat content is significantly lower. I don’t see any plausible reason for not selling cheval steaks on the British meat market-it’s not as though you are eating someone’s prize race horse or show jumper. I think the British attitude can be somewhat of a “stalwart” in it’s thinking and the culinary arts are missing out big-time. I am curious to know if you horse meat aficionados also eat dogs, cat, gerbils, etc? I would not think of eating my (or any other) horse but perhaps I am not as sophisticated as you and perhaps not as hungry? My point is that the issue of horse meat is one of culture, and you demonstrate that quite well. It’s perfectly acceptable to eat horse in France, Germany, etc, but absolutely not here. Why is this? I think you answered the question in your first sentence – it’s a matter of culture. I am not a good person to ask since I eat meat only occasionally but, due to my having been reared among animals, it would never be a horse. They do have the most beautiful eyes you know – :). I realize it is a discussion about cultural preferences and I appreciate your response. Thank goodness a normal, measured response to the subject. I think you can’t argue there is any more “acceptability” eating pig, cow or lamb over horse. It is purely a taboo. Many Indians consider cows sacred and Jews consider pork unclean. Our taboo of horse is equally strong but seems to have been little studied as a social phenomenon. We seem to be unaware of the reason for our belief. Of course we have a bond with horses and they can be broken to serve us which Is the root of the taboo. Cows and oxen are also used as beasts of burden, draw ploughs and can be trained much like horses. The very nature of taboo is that no amount of common sense can overcome it. I frankly cannot bear the idea whether it is a taboo or not….please enjoy – bon appetite. Thanks Mary but I’m a vegetarian. While I was serving with the British Army in Belgium , I lived 10 minutes from the French border so we used to do a lot of our shopping over there. I believe when you visit / live overseas you should at least try the local cuisine. Horse, Frogs Legs and Snails were regularly in the basket and I must admit I really ennjoyed all of them. At a local African restaurant we also had zebra, kangaroo and crocodile. Being a dog owner I dont know if i’d try the meat, The UK needs to rethink, i’m sure Janet Street Porter did a campaign promoting horse meat at a race track and lots of people tried it and actually enjoyed it. Good post in the first place. I hope the UK never will make horse meat a thing unless dog or cat is a thing to which I would also hope would never happen, horses are just as much if not more so loving than both dog or cat! people need to start thinkin logicaly, i mean im pretty sure everyone would treat every animal that they own with the same respect. regardless of wether you ‘rode’ the thing or read made up stories about it, an animal is an animal. the reaction of the masses is not the genuine reaction each would give individualy without the news telling them ‘scandal’ and ‘contam’. if people thought for themselves instead of thinkin what media wants then they’l realise its no big deal, meat is meat and meat is not conciouss therefore does not care if you feast upon it! I’ve got think about this a bit…..